Behind-the-scenes in Creative Thinking (HUM 246). Inside the classroom: Is there a God? Should abortion be legal? Do aliens exist? 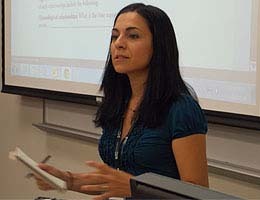 Not every question has a definitive answer, and Professor Ilaria De Santis’ interactive class explores fresh perspectives in critical thinking, encouraging students to open their minds. “Heated” topics include gender equality, bilingual education, moral beliefs — always with respect for different viewpoints.